Mrs. 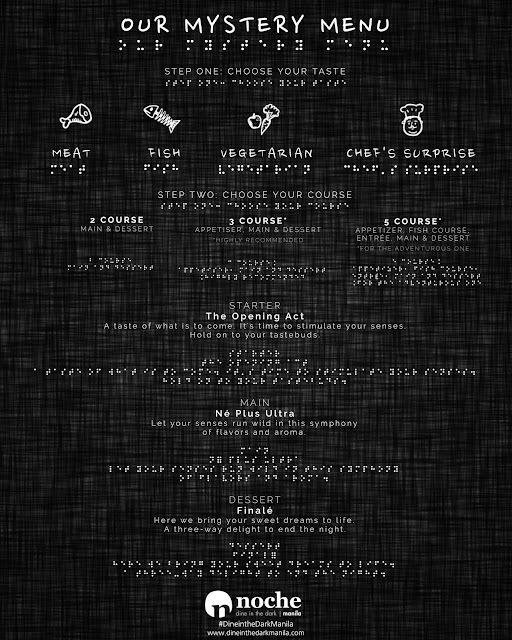 Wise: A TASTE OF MYSTERY: DINING IN THE DARK! A TASTE OF MYSTERY: DINING IN THE DARK! I come from a very visual world.... TV! My scripts are always in audio-video format. I have the this habit of scrutinizing edit points, jump cuts, color, etc when I watch a movie or any video presentation. Moving visuals are very important for me. 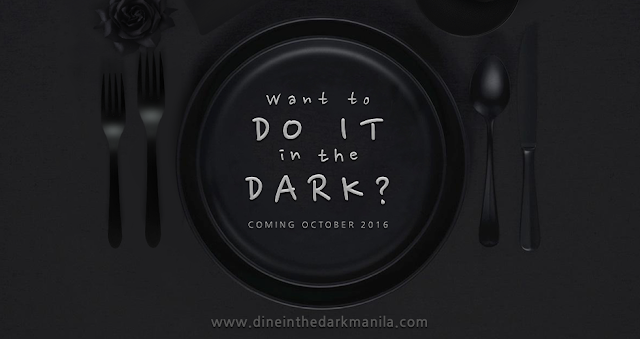 The concept of Dining in the Dark, actually came from Europe, traveled all the way to Canada and the U.S. And now, it has reached Manila, yey! 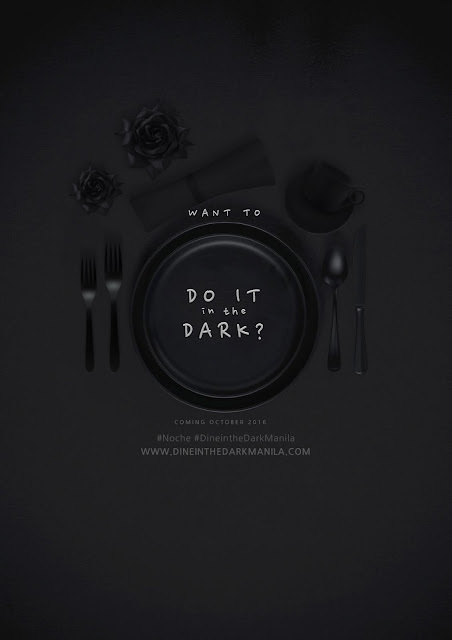 As NOCHE: DINE IN THE DARK MANILA brings this very exciting and one of a kind dining concept. If all I can see is pitch darkness... will I be able to survive? Relying only on my sense of touch, smell, sound and taste, I think is really hard. But hey... its about time that I sharpen my other senses, aside from my sense of sight. As a blogger, I am also constantly hooked up on my gadgets. But NOCHE: DINE IN THE DARK MANILA requires their guests to put in a secure locker area their phones, watches and gadgets that may emit This is anoher adventure.... and a nice way to interact with fellow diners. Of course the menu is a MYSTERY. That completes the fun! 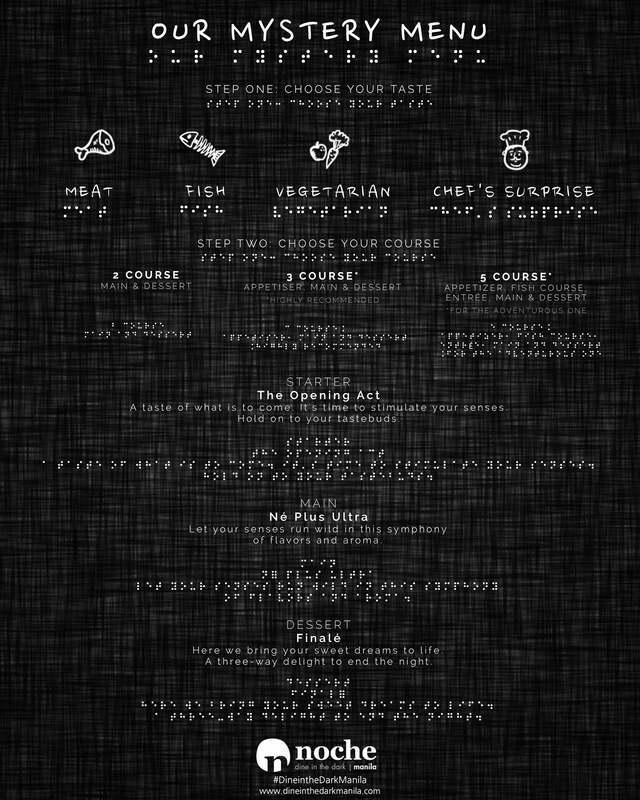 You just have to inform the organizer if you prefer meat, fish, vegetarian or chef's surprise. You also have to tell them if you have any food allergies. This gastronomic experience, is in partnership with the Resources for the Blind, a non-government Christiam organization serving blind people all over the Philippines since 1988. Visually impaired Filipinos will be assisting the diners. 2 course (Main & Dessert) option for an opening promo price of Php 699 instead of PHP 999.00, and a 3 course (our most recommended- see above) option is in an opening promo price of PHP 999.00 instead of PHP 1,499.00. We also offer a 5 course option (For the grand adventurer) for a promo price of PHP 1,499 instead of PHP 1,999. 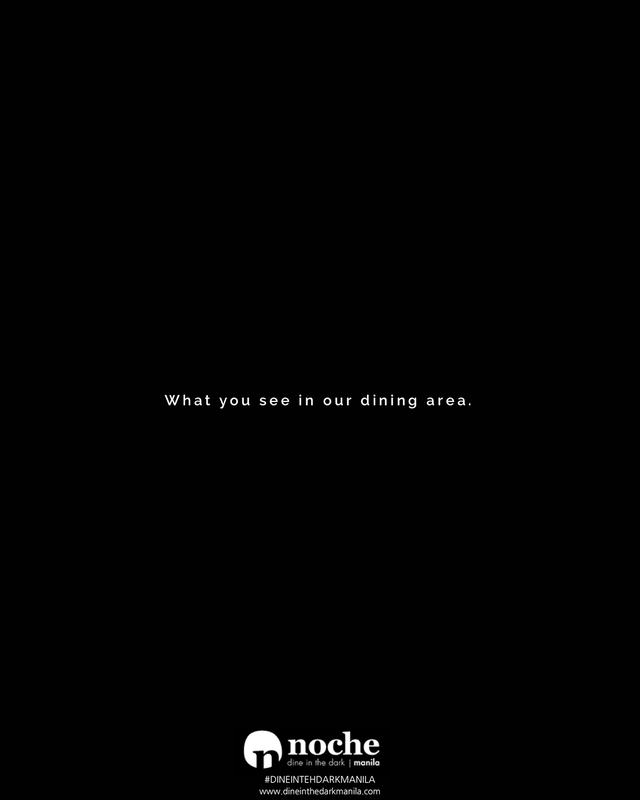 Spread the news to all your adventurous friends -- and experience Dining in the Dark!